What a pleasant surprise this book ended up to be! 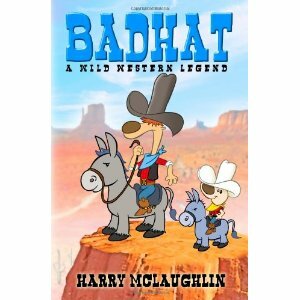 With vivid characters in the memorable setting of the Wild West, rip-roaring scenes and witty, Western dialogue, I chuckled throughout this heartwarming and adventurous story. Badhat, a lonely prairie dog wanders aimlessly in search of a purpose in life. He asks “the Almighty” for a sign and ends up in the town of Dagnabit, where the Gopher Broke Gang—outlaw bullies—are ruling and oppressing the town. Badhat just wants to quench his thirst and move on, but his subsequent actions lead him into a situation for which he isn’t prepared. Now he is faced with making choices that will ultimately teach him that he is not alone in this world and that his actions affect others. It becomes clear that he needs to figure out where he belongs, and how to let go of his past. The townsfolk, colourful characters you just have to love, learn their own lessons as well. More than just a funny tale, the themes that run throughout this book are worthy and profound. Among them: Stand up for what is right; Trust God to guide you in life; and Learn to be proactive rather than relying on others to solve your problems. This may sound heavy, but the author, Harry McLaughlin handles this deftly and successfully, without a preachy tone at all, leaving the reader with such a satisfied feeling and a few things to ponder on. I easily came to admire the author’s writing style, his mastery of dialogue, his cute illustrations scattered throughout the book, and the way he makes animal characters come alive. I have become an instant fan. Disclosure: Thanks to Harry McLaughlin and ReviewTheBook.com for sending this book for review. I was not compensated in any other way, nor told how to rate or review this product. What an adorable cover! I'm glad to see the book is as cute.